Keeping your bird's cage clean is an important preventive method of keeping it healthy in order to avoid an infection. Although you may do some moderate cleaning a few times per week, your parrot's cage should be completely cleaned out about once a month. The first step is to remove all of the loose food, poop, and other dirt to the bottom of the cage. I start by simply cleaning the droppings off of perches and the grate. Spray bottles are particularly useful for parrot cage cleaning, especially if you can control the pressure of the spray. 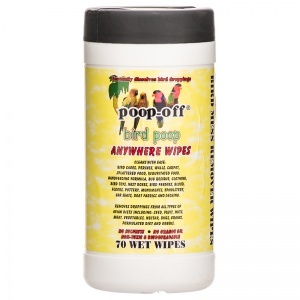 A product called poop off comes in handy for cleaning cages. It comes in wipes and it spray bottles. It says that it is completely nontoxic for birds, but I would avoid spraying/wiping it near your bird or while your bird is inside its cage, and wash the area off with water after you've used the product just in case. After all of the droppings and waste are off of the perches and other cage areas and below the grate, remove the cage tray and empty the contents. Whatever you decide to use for the bottom of your parrot's cage below their cage grate, the lining should be changed a few times every week. This is especially important if your parrot is a messy eater because a mess of rotting food under the grate is a breeding ground for bacteria. Remove everything from inside of the cage such as the bowls, perches, toys and other accessories. Some of these accessories will need to be cleaned. Take the cage apart completely if you can. (With small plastic cages, it is easy to take them apart into pieces, but with large iron cages are obviously impossible to take apart except for the bottom tray and grate.) Wash bowls separately with hot water and hand soap and rinse thoroughly. Depending on the type of bowl, some can be filled with boiling water and left to soak to sterilize them, but this is probably not appropriate for plastic bowls. Cage emptied of all toys, bowls, perches, swings. Take the cage to your shower, tub, or outside to be washed. In the shower or tub, you can use the shower head or faucet. If you are outside, you can use a hose. If your cages are so, big that they don't fit into your shower or tub and you can't bring them outside, you can still wash your parrot's cage inside. Use an area with a tile floor or roll your bird's cage onto something to protect your floor from getting wet. You can mix a solution of half water and half vinegar, or a very mild bleach solution to clean out the rough spots really well. When cleaning your parrot's cage, it is important to keep your parrot away from any chemicals and prevent the fumes from getting to your parrot. Keep chemical usage to a minimum, keep doors closed, keep vents on and keep your parrot as far away as possible. If you'd like, move your bird into a completely different area into their travel carrier (to keep them out of trouble). Cleaning a small plastic cage with a mild bleach solution in the bathroom shower. A sponge is great for absorbing the solution to wash the cage with, but a bristle brush or rough sided sponge would be better for scrubbing the hard to remove poop and dirt. You can wipe off your perches with some of your solution or dip them and soak them in solution, and rinse them thoroughly with plain water. Let the perches dry completely before putting them back inside of your cage. Many toys cannot be washed, but if your toys are plastic or acrylic, you can wash them with your solution, rinse them thoroughly with water and let them dry. Be sure to rinse your entire cage off with clean water thoroughly after you are done. Wiping down and sanitizing a dirty foraging tree. You can also use the same solution to clean your foraging tree, activity tree, play stand, or play gym. 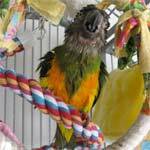 After you are done washing and rinsing, you can dry your cage off with a towel or let it air dry. Now that you have removed everything out of your parrot's cage, it could be a great time to do some rearranging, add some new perches, and surprise your bird with a new toy! Do you know any tricks for cleaning between the bars? I usually take a cloth and go bar by bar, which takes forever. When it dries, I see that I have still missed some stuck on gunk, especially where the vertical and horizontal bars meet. Any suggestions? Hose down or use a thin sponge that fits between bars. I feed D'art fresh veggies and fruit daily. From reading, other people replies those foods can create bacteria that can get D'art sick or am I just worrying too much? Is just picking up the food that not eaten on the bottom tray enough? or would you change all the paper on the bottom of the cage everyday? Also, sometimes D'art will eat his poop that is caught by the cage grate or when I am playing with him outside his cage. Should I be concerned? Twice a week I change the newspaper and wash the grate. And once a month I do a full clean of my cages. After emptying the cage of all the toys, food dishes, etc, I take my hand vac and vaccuum up any loose depris. Then I take a swiffer duster and dust the cage between bars and all the nooks and crannies. Then I take a sponge that has been dampened with hot water and vinegar and wipe everything down. The bottom tray and grates are washed and soaked with hot water and vinegar in the bathroom. Due to the size and weight of my bird's cages, I cant haul them into the bathroom and spray them down. I also fill my sink with hot water and vinegar and soak all toys and perches. Food dishes are washed daily. I also vaccum around the cages every other day. Birds have to be the messy pets Ive ever had! lol! But i love them anyways! Or you could try hosing it down. I change the newspaper and scrub down the grate and bottom half of the cage everyday. Which is very annoying because it's a very big flight cage. I have to say that the little steam cleaner we bought has been the best $70 I've spent in a loooong while! No more icky vinegar or diluted bleach smell or expensive poop cleaners!